A recent study from the University of Canterbury proclaims that depictions of violence in LEGO set catalogs and the number of weapons in LEGO products has increased significantly as the result of a metaphorical “arms race” between toy manufacturers. The article’s authors include Qi Min Ser, Elena Moltchanova, James Smithies, Erin Harrington, and Christoph Bartneck, builder of the life-sized Unikitty and author of The Ideal Order. The study looked at LEGO sets produced between 1978 and 2014 (excluding Duplo and Junior lines) and found that nearly 30% of today’s LEGO sets contain at least one weapon brick. It also explained that the chances of observing violence in LEGO catalog pages has increased steadily by 19% each year. Currently, around 40% of all catalog pages have some type of violence. “In particular, scenarios involving shooting and threatening behaviour have increased over the years. The perception of nonverbal psychological aggression increased at a similar rate. The atmosphere of the violent acts is predominately perceived as exciting.” The study concludes that “violence in LEGO products seems to have gone beyond just enriching game play” in attempt to attract more customers. 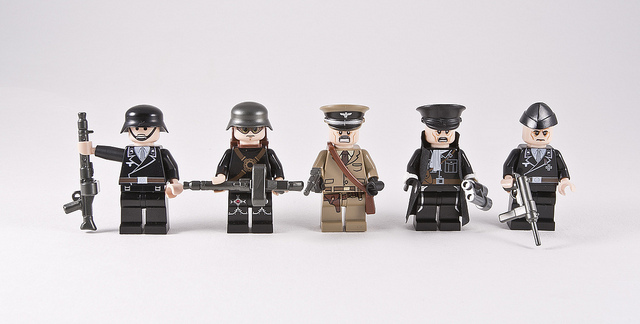 Turning to the online LEGO community, both the photo above by Brick Police and the one below by Hammerstein NWC use LEGO minifigures and weapons to create graphic, violent scenes that may be considered offensive or unsafe for children. But these images highlight a huge oversight in the University of Canterbury’s study: builders, many of whom are adults, who want to incorporate realistic weapons into their builds cannot get them from LEGO directly. The Danish company refuses to sell such weapons even though there is a high demand for them. Instead, builders must turn to third-party companies like BrickArms, BrickWarriors, Citizen Brick, or Modern Brick Warfare to get their fix of tiny, plastic violence. There’s no denying the facts of the study. LEGO has included more and more weapons and scenes of violence on their products over the years, starting with the introduction the very first LEGO weapons in the 1978 Castle theme (sword, halberd, and lance) and obviously continuing with trademarked themes like Marvel and DC. But the study leaves several important questions unanswered. Should we shield children from violent toys? Is there a causation between violent toys and games during childhood and actual violent tendencies in adulthood? Should LEGO reduce the number of weapons and scenes of violence in their products? And would such a change impact customer satisfaction positively or negatively overall? What do you think about all of this? Let us know in the comments!